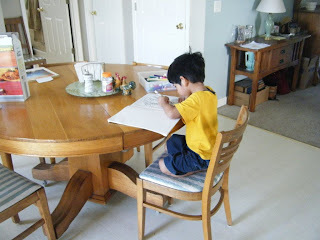 (A continuation of last week's home tour along with the ladies from 4 Moms, 35 Kids, seen at The Common Room, Raising Olives, Life in a Shoe, and Smockity Frocks. See their comments sections for more participant open houses.) Caveat: Like most of the other ladies in the "open house", I am showing my home as it is today, in an "unvarnished" state. Don't look too closely. Sorry Mom. Here is the first thing you see when entering my home from the side door. This is the door closest to the driveway and garage. DH's lunch box is parked on the island waiting for me to empty its contents. 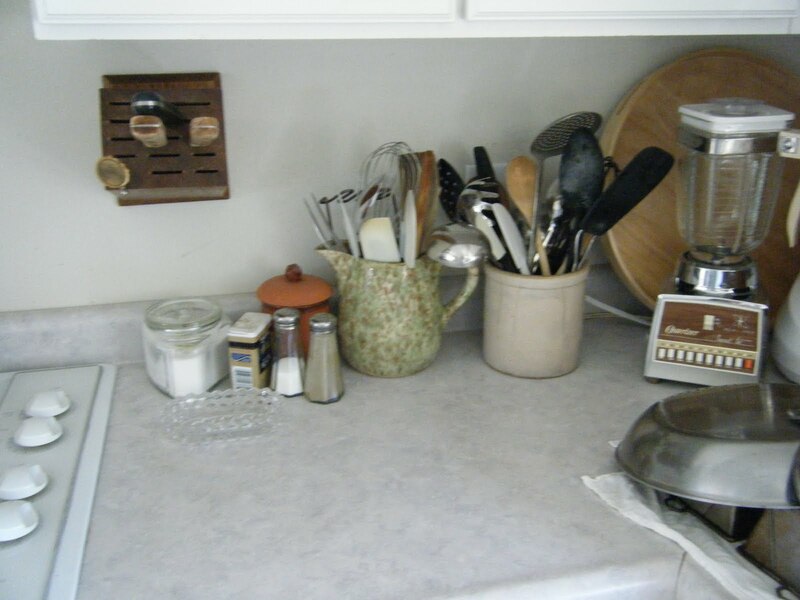 The island counter often has more clutter than this and occasionally less. In the background you can see the former classroom. It is being emptied out in preparation for some remodeling. Proceeding further in, you see that we are in the midst of adding a wood cookstove to the end of the dining area. 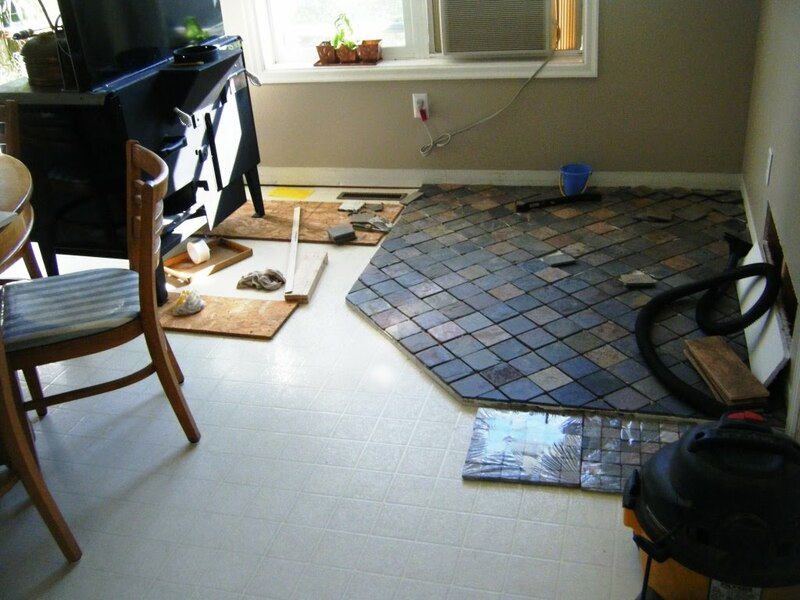 (New Kitchen Queen cookstove seen at the left, occupying valuable floor space while it's waiting for installation.) We're laying a slate flooring pad and will be working on the back wall next week. The stove will be in place as soon as we can get someone to do the chimney for us this month. 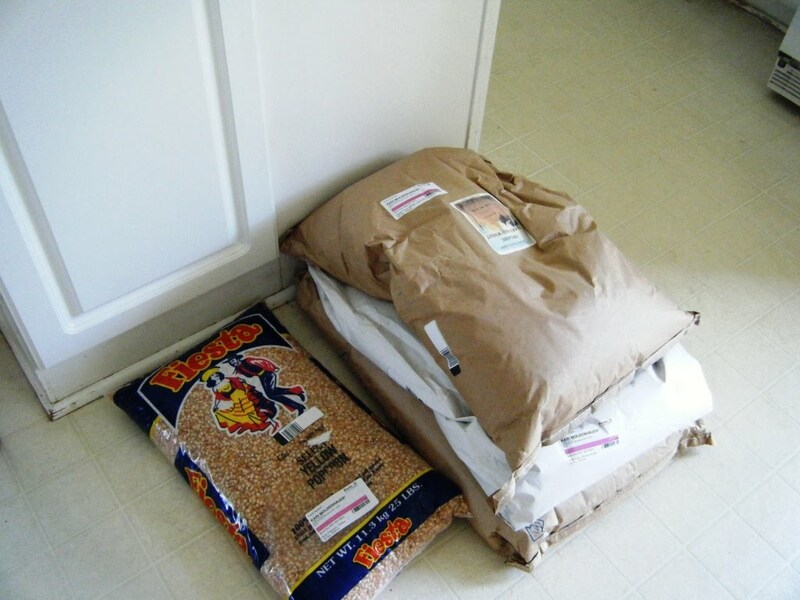 Here is where my recent bulk purchases of various grains are being staged. I am adding them, one at a time, to the freezer for a few days so the flour weevil eggs (that are in all grain products - including flour from the grocery store) will be killed before I put them into containers for storage. I do this with all grains and flours that I buy. The kitchen. 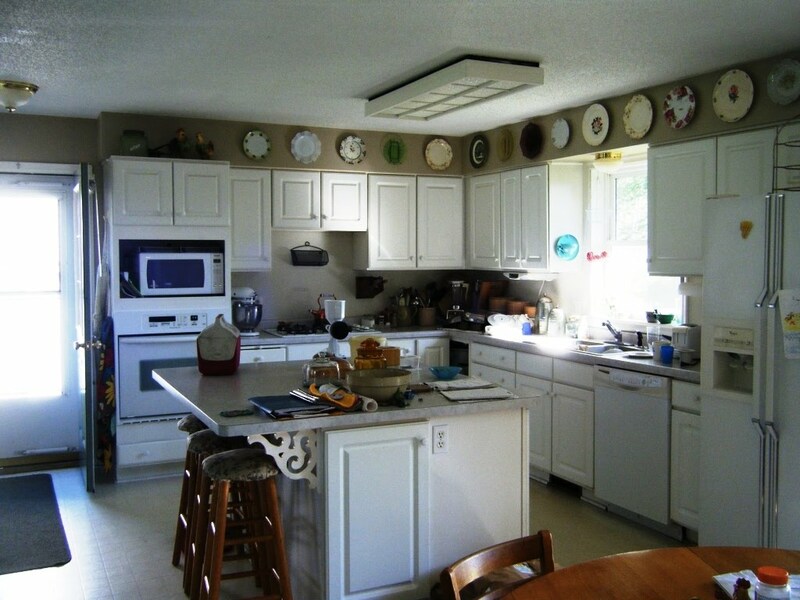 Several plates on the soffit are parts of sets I have and a few are heirloom pieces. Over the microwave is a set of porcelain chickens my mother bought when she was young, and a cookie jar from the depression era that belonged to my great-grandmother. Next to the refrigerator is a spider plant that I received from my son for mother's day (a school project) in 1997, the week we moved into our new home here. 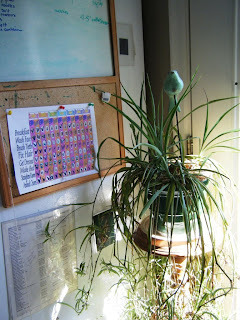 My son was a sweet little eight year-old then, he's a still-sweet 21 now and I've managed to keep the plant alive all these years. Behind that is the obligatory homeschooler's children's chore chart. My view at the sink. 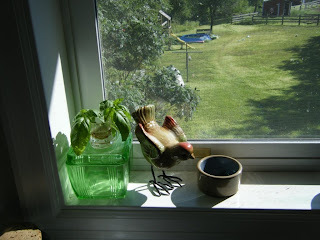 Something about this little bird is very appealing to me. I love pots, glaze, and glass, so the little guy fits right in. Mounted on the wall is the knife block my dad made for me many years ago. Most of the knives are still in the dishwasher. (Horrors! I know they aren't supposed to go in the dishwasher, but I do it anyway. The knives have been going in the dishwasher for 13 years and they are still fine. I like to simplify housework.) 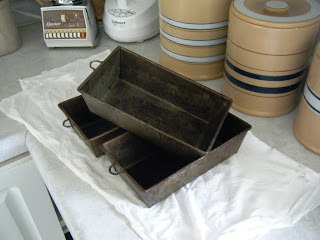 The utensil pots and the salt dish are heirlooms also. I like old stuff. I like young stuff too, like little Isaac here, hard at work coloring. The table? Heirloom too. My in-laws rescued it from someone who was "modernizing" in the 1960's. My mother-in-law refinished it back then, and it's really beautiful, I think. The chairs are not heirlooms yet, but I bought them at a hospital's remodeling sale in the early 1980's. The lazy susan was a gift from my daughter last Christmas. These are my dad's bread pans that I've been using. Dad passed away a bit over a year ago and Mom gave me these recently. He loved making bread, and really excelled at it. He was a remarkable man in many ways. Thank for visiting! I enjoyed putting this post together. A wood stove? How lovely! I've always wanted one = ) They are practical and charming. I love how open and bright your kitchen etc is, its very nice. I look forward to reading more of your blog! I love the color contrast in your kitchen between the walls and the cabinets. Lovely! What a gorgeous view of your back yard from the sink window. 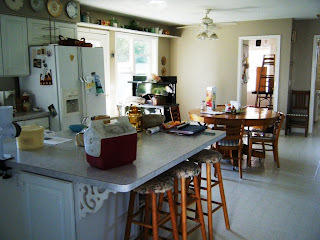 I love islands...wish we had one but our kitchen isn't wide enough for one, unfortunately. Oh, I love white kitchens! So bright and airy. Beautiful, Ma! 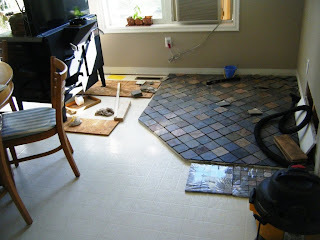 :) Exciting to see the flooring for the wood stove going in. It looks great! I love your home. In picture it is lovely, to visit it is even more lovely.